Exploring the world under in Sao Tomé & Principe, both ancient volcanic islands, are home to some of the world´s most spectacular rock formation, above and below the waterline. With drop/offs of over 35 meters, overhangs and cascading boulders, there is plenty of sea life here to keep visitors coming back for more. There are introductory dives and PADI/NAUI course, all dives led by qualified PADI/NAUI professionals. Divers will eyewitness pristine reefs and dramatic seascapes and find themselves amidst reef fish and big game fish as well as endemic species of eels, wrasse and shrimps. 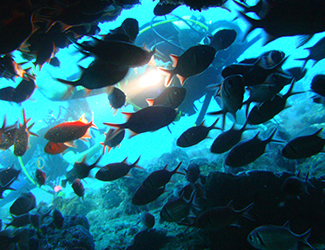 Bom Bom Island Resort has a certified NAUI dive instructor. Based on NAUI’s policy, the minimum age for children to go diving is 12 years old. Diving and snorkeling are open all year round. Small fish breed on these grounds, attracting bigger predators. It is not uncommon to find yourself swimming amidst schools of barracudas or snappers. The waters here are home to variety of sharks, stingrays and octopuses and have the largest population of moray eels one could imagine seeing anywhere. In addition, both Sao Tome & Principe are popular breeding grounds for turtles. With a strong conservation progamme in place on both islands, there is a very good chance of spotting one of these majestic creatures.